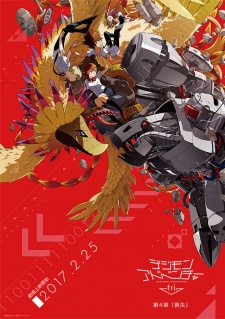 Watch Digimon Adventure tri. Loss full episodes online English Sub. Synopsis: First there was Meicoomon’s rampage, and then the reboot ended up happening. Taichi and friends left Meiko behind in her anguish, and headed for the Digital World. Sora’s kindness in putting others before herself only makes Biyomon that much more suspicious. This leaves Sora stunned and hurt, and Taichi and Yamato are at a loss for what to say to her. As everyone discusses what they should do from here in the Digital World, Meicoomon suddenly appears and then vanishes. For some reason she still has her memories, as she wanders around with tears in her eyes, looking for Meiko. Seeing this strengthens the kids’ resolve to travel through the Digital World in order to save Meicoomon. But then before their eyes appears that man who had been with the Dark Masters.